The Cuisinart CSG-800 is a digital grill thermometer and timer which is the new tool in the battle for grilled perfection. Featuring a programmable, digital thermometer and timer, it gives you all of the information you will need on your grilled meats. The flexible 45 inch temperature probe is long enough for any cut of meat. Press the power button, select the meat type, choose one of the five taste settings, select the target internal temperature and insert the probe. The thermometer will signal when it’s time to eat. The Cuisinart Digital Grilling Thermometer and Timer has many exciting features for users of all types. 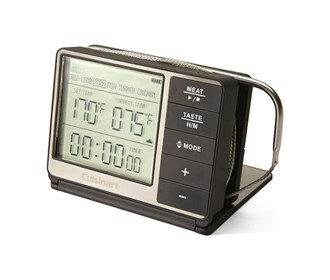 See the Cuisinart Digital Grilling Thermometer and Timer gallery images above for more product views. 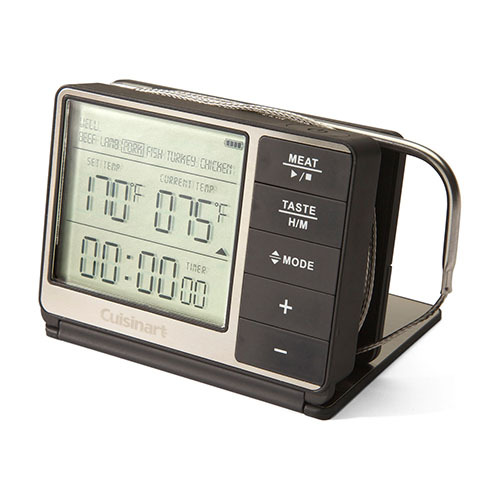 The Cuisinart Digital Grilling Thermometer and Timer is sold as a Brand New Unopened Item.